Faculty 360 is an all-around look at a newly hired UT AgResearch faculty member. In this issue we feature Meg Staton, assistant professor of bioinformatics in the Department of Entomology and Plant Pathology. Dr. Staton joined UTIA in January 2014. She has a research program focused on forest tree genomics and bioinformatics, and she also provides collaborative bioinformatics support to research groups across UT AgResearch. 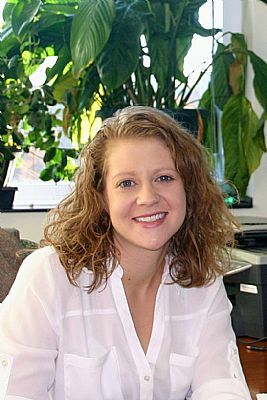 Staton received her PhD in environmental science with a minor in genetics from Clemson University in 2007. Something that gets my brain going is envisioning the world and all the new technology we will have in twenty, thirty, or fifty years and then trying to figure out how to get us there. Stepping back and thinking broadly helps me to think more creatively. When I’m not working, I like to go for a run or head to the gym—it helps me to clear my mind and relieve stress! As a bioinformatics scientist, I’m a fan of figuring out how to use all the amazing new advances in computers to help agriculture. Computers are revolutionizing all parts of our lives, and the opportunity to understand giant molecular and ecological data sets is going to change agriculture in amazing and positive ways. A life experience that connected me with my career choice is gardening with my mom growing up. I even had lots of houseplants in my dorm room in college. It wasn’t until graduate school that I realized computers and plants could be part of the same discipline. A profound change in my field that will be coming in the next ten years is that all biological scientists will have computational skills. Previously, data sets were small enough to manually analyze and even now, the analysis of new big data sets is often outsourced to a collaborator. Many successful future biological scientists will embrace the era of big data and know how to use computers and write their own code to get to the answers they need. A favorite part of my job is collaborating with people across many different academic departments. On any given day I might work on soybeans, Arabidopsis, soil microbes, or sheep. The diverse questions being studied across UT AgResearch keep me on my toes and allow me to learn about interesting new agricultural systems. It is very fulfilling to help bring bioinformatics knowledge and support to so many groups. Something that excites me about being part of the UTIA community is the opportunity to see genomic and bioinformatic discoveries translated to the field. We have a great integrated research and Extension system that can move our basic science efforts to the real world of food production and ecological conservation, and also communicate needs from farmers. It’s great to be reminded of how our basic science discoveries are being used to make a real-world impact.